Cracked Out Cauliflower Gratin - cauliflower, leeks, mushrooms and bacon tossed in a homemade Sargento sharp cheddar cheese and Ranch sauce. Top with crushed butter crackers. SO good! We don't even like cauliflower and we devoured this! Can make ahead and refrigerate for later. Stop what you are doing and make this ASAP! Stop what you are doing and add this "Cracked Out" Cauliflower Gratin to your menu! 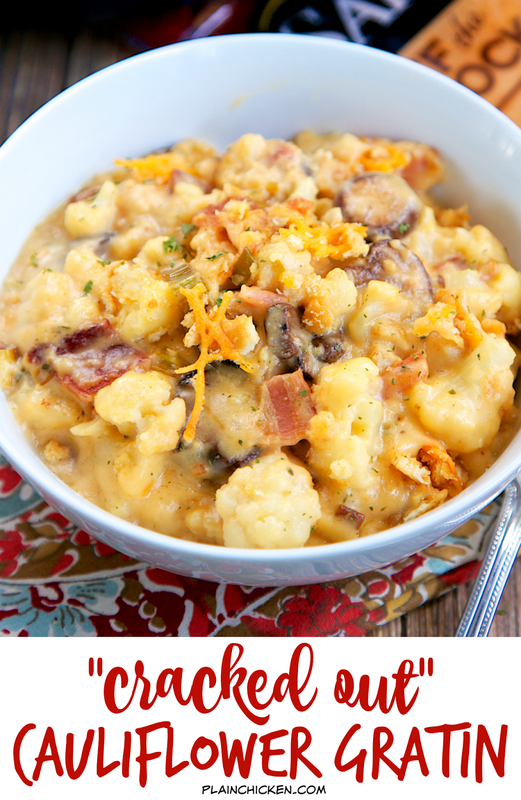 It is crazy good, and we don't even like cauliflower! 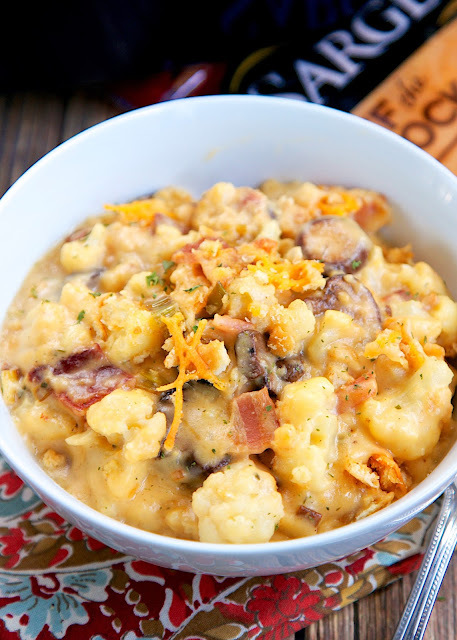 What could be better than veggies tossed in a yummy cheese sauce with bacon and ranch? Um, nothing! 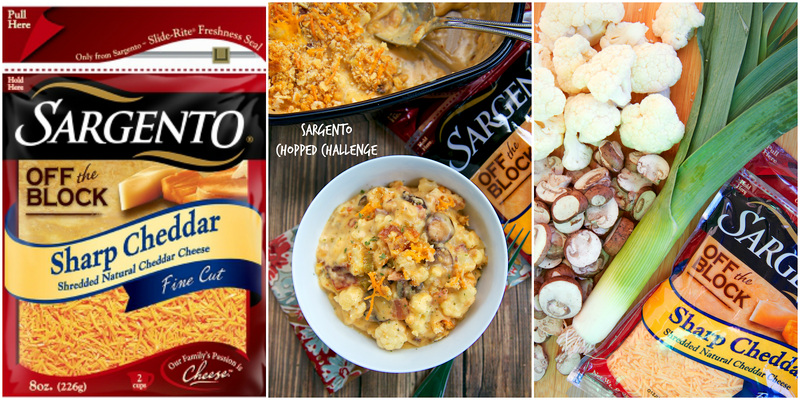 Sargento® is running a Chopped At Home Challenge. Like the Food Network show Chopped, you have to make a dish with the ingredients Sargento gives you. Round One is going on right now. 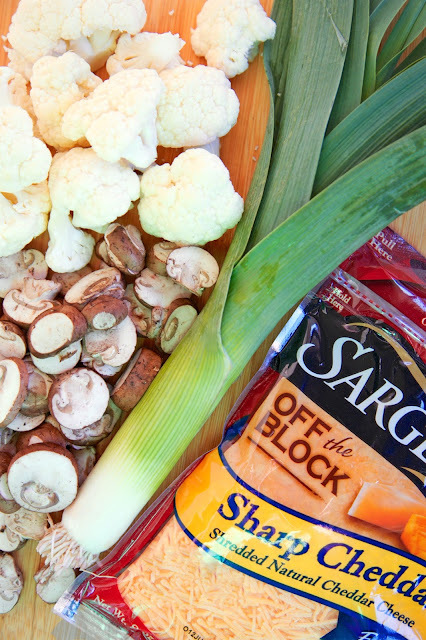 The challenge is to make some delicious comfort food with Cauliflower, Cremini Mushrooms, Leeks and Sargento Sharp Cheddar Fine Cut. The cheese, mushrooms and leeks were no problem for me. The cauliflower, on the other hand, was tricky. We aren't cauliflower fans, so I was worried how this dish would be received. Well, I had absolutely nothing to worry about. This "Cracked Out" Cauliflower Gratin was amazing! Like, really, really good. Total comfort food! It was like macaroni and cheese but with vegetables. Chicken Legs has already requested this again next week. We served this as a side dish, but it could also be a main dish. You can make this ahead of time and refrigerate it before baking. Submit your recipe to FoodNetwork.com/ChoppedChallenge for the chance to win $5,000 and a trip to New York City to compete in a televised Chopped cooking challenge for a $10,000 grand prize! 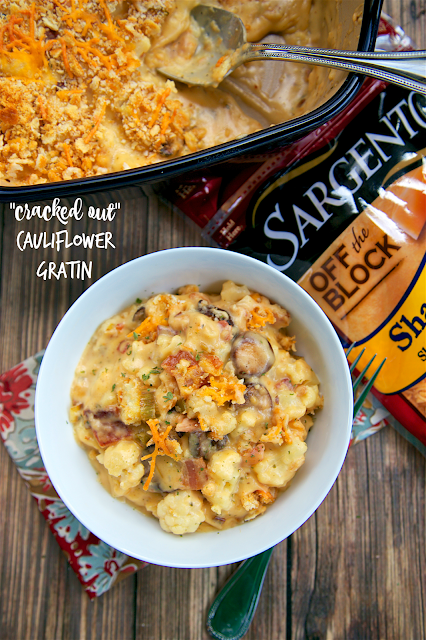 For more inspiration, check out the Sargento Pinterest page Pinterest.com/sargentocheese/ or visit www.sargento.com/Shredded for more information. In a skillet over medium heat, cook bacon until crispy. Remove from skillet and drain on a paper towel. Reserve 2 tablespoons of bacon fat, discard remaining fat. Heat bacon drippings in skillet over medium heat. Add mushrooms and leeks. Cook until mushrooms are soft, about 5 to 10 minutes. Place cauliflower in microwave safe dish. Add 2 tablespoons of water and cover. Microwave for 2 to 3 minutes. Drain. In a medium saucepan over medium heat, melt butter. Whisk in flour. Slowly whisk in milk. Continue stirring until thickened. Remove from heat. Stir in Ranch dressing mix and 1 1/2 cup Sargento Sharp Cheddar Finely Cut cheese. Stir until cheese is melted. Combine vegetables and cheese sauce. Pour into lightly greased 8x8-inch pan. Top with remaining Sargento Sharp Cheddar Finely Cut cheese and crushed butter crackers. Sounds - I'll make the next time I go to Costco for cauliflower and bacon. If you sub shrimp for the bacon it will work nicely for lent. Rebecca - the 'bacon' is the first item in the recipe.